Teva – Without waiting for the cert petition in Lighting Ballast, the Supreme Court accepts Teva to decide whether de novo review of claim construction is the appropriate standard of review. Senju - A split panel ‎affirms dismissal based on claim preclusion where the patents in suit that had been ruled invalid in a prior litigation had been reexamined and narrowed to avoid the prior art. The majority of the panel disagreed with Senju that differences in the claims were critical to claim preclusion. According to the opinion, the claims that emerge from reexamination ‎do not in and of themselves create a new cause of action. A "reexamined patent" is the original ‎patent; it has just been examined another time. Reexamination does ‎not involve neither the filing of a new patent application nor the ‎issuance of a new patent.‎ For example, amendments to the disclosure ‎cannot introduce new matter, and no proposed claim is permitted to enlarge the scope of claim coverage. As a result, a reexamined patent cannot contain ‎within its scope any product or process which would not ‎have infringed the original claims. The district court's denial of Endo's motion for preliminary injunction based upon its ruling that Actavis and Roxane had implied licenses under a settlement agreement was vacated and remanded. The patents in this litigation issued after settlement of the first case. Upon filing suit Endo moved ‎for a preliminary injunction to prevent the marketing and ‎sales of the generic formulations. The district court accepted the argument that Appellees had implied ‎licenses so denied the motion. On appeal, after quickly dismissing the express license argument because the patents in suit were not continuations of the Licensed Patents, the panel addressed the implied license argument. The majority held that the district court erred in ‎concluding that Appellees were impliedly licensed to practice the asserted patents. While the asserted patents claim priority to the same provisional applications as the patents that were the subject of the settlement agreement, the specifications of ‎the asserted patents are different, and that the claims cover different ‎subject matter. Here, rather than grant a license to an "idea," Endo granted to Appellees a license and covenant not to sue ‎limited to specific patents and patent applications. If ‎Appellees wanted to market and sell their accused generic ‎products free from a threat of being sued for ‎patent infringement, they could have negotiated for the appropriate language in the settlement ‎agreements. Having agreed to licenses that do not ‎cover the patents at issue in these appeals, Appellees will ‎not now be heard to complain. First, the court must identify "a single reference, ‘a something in existence, the design characteristics of which are basically the same as the claimed design.'" The "basically the same" test requires consideration of the "visual impression created by the patented design as a whole." We have noted that "the trial court judge may determine almost instinctively whether the two designs create basically the same visual impression," but "must communicate the reasoning behind that decision." Once the primary reference is found, other "secondary" references "may be used to modify it to create a design that has the same overall visual appearance as the claimed design." These secondary references must be "‘so related [to the primary reference] that the appearance of certain ornamental features in one would suggest the application of those features to the other.'" 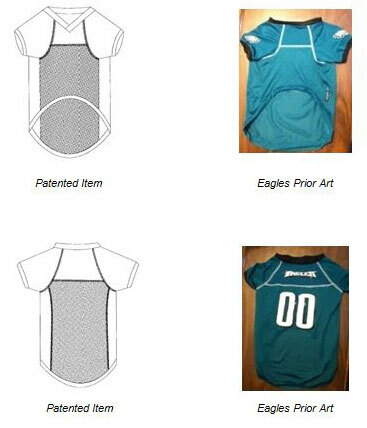 On appeal, MRC, the owner of two design patents directed at pet jerseys (an example of which is shown on the left, below), argued that the district court erred in concluding that the primary reference, an Eagles pet jersey (shown below, on the right), is "basically the same" as the claimed design. In particular, MRC complained that the lower court failed to translate the claimed design into a verbal description as required by the Circuit in High Point Design LLC v. Buyers Direct, Inc., 730 F.3d 1301, 1314 (Fed. Cir. 2013). The Circuit conceded that the district court did not expressly translate the claimed design into a verbal description, but reiterated that "the purpose of requiring district courts to describe the claimed design in words is so that the parties and appellate courts can discern the trial court's reasoning in identifying the primary reference." Because the Circuit found it "entirely clear from the district court's opinion what it considered to be the relevant design characteristics of the ‘488 patented design" and agreed with the lower court that the Eagles reference and the claimed design created "basically the same" overall impression, MRC's argument with respect to the first step of the Durling test was dismissed. With respect to the second step of the Durling test, MRC argued that the district court erred in failing to explain why a skilled artisan would have chosen to incorporate the features of another reference known as the "Sports K9" jersey with the Eagles jersey. The court again dismissed MRC's argument, explaining that while there must be some suggestion in the prior art to modify a primary design with features from a secondary design, two designs may be "so related that the appearance of certain ornamental features in one would suggest the application of those features in the other." Indeed, in the instant case where both references are designs for pet jerseys, the Circuit found: "it is the mere similarity in appearance that itself provides the suggestion that one should apply certain features to another design."